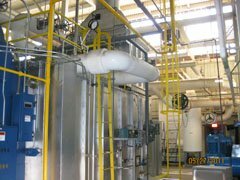 The project involved a three (3) phased approach to upgrading the central HTHW heating plant. The first phase of the project involved a study to access the condition of the HTHW Generators and auxiliary equipment. The results of the study recommended replacement of Generator (G-2), replacement of the HTHW distribution pumps and upgrading the plant wide controls to a distributed control system. The second phase of the project involved upgrade of the plant wide controls. Dedicated combustion controls and burner management system panels were installed on Generators (G-1 & G-3) along with a balance of plant control panel. The controllers were microprocessor based PLC controllers utilizing a windows based operating system. Human Machine Interfaces (HMI’s) to the control system included touchscreen interfaces at each control panel and a computer with a 24” and 46” monitor in the control room. Most of the control devices were replaced as well due to age. Ultrasonic flow and energy meters were installed on the HTHW return mains coming back to the plant. Gas and oil flow meters were installed on each generator to monitor energy usage and efficiency. 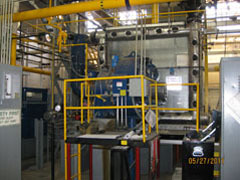 Electric valve actuators were installed on the HTHW supply and return mains leaving the plant. Several of the gate and globe valves serving pumps and generators were replaced with triple offset rotary valves for a bubble tight close off and ease of operation. A new variable frequency drive was also installed on the forced draft combustion air fan for Generator (G-1). The third phase of the project involved replacement of a 40MMBTUH Generator (G-2), installation of a flue gas economizer, replacement of the forced draft combustion air fan, replacement of an atomization air blower, replacement of all four (4) HTHW distribution pumps, installation of economizer pumps, and piping modifications to pipe the economizers in a side car application. The new pumps were equipped with an air cooled seal flush cooling system. 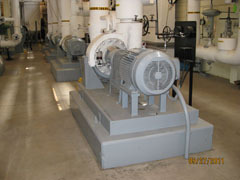 Variable frequency drives were installed on the new forced draft combustion air fan and pumps. The new generator with flue gas economizer will have an efficiency of approximately 85%. This work required numerous piping modifications for the new generator, economizers, pumps, fuel trains, flow meters, and valves. A pipe stress analysis was performed on the entire HTHW piping system to verify the manufacturers and the ASME code requirements. A new combustion control and burner management system panel was installed for the new generator to match the panels installed in Phase 2. A new vortex shedding flow meter was installed on the HTHW return on the new generator to measure capacity and efficiency. The construction cost for Phase 2 of this project was $1,200,000. The construction cost for Phase 3 of this project was $2,800,000.